Wow! This month is flying by with all manner of blogging events! Did you know that October is Cookbook month? That’s right, this is the time of year to dust off those old cookbooks and try something new! So, some of my blogging friends and I decided to do just that. Only we’re not cooking from just any cookbook – nope, we’re using community cookbooks! You know those ones that churches love to put out where everyone submits their favorite recipe? I decided to take things a step further and use a vintage cookbook I found at an antique store a few years back. 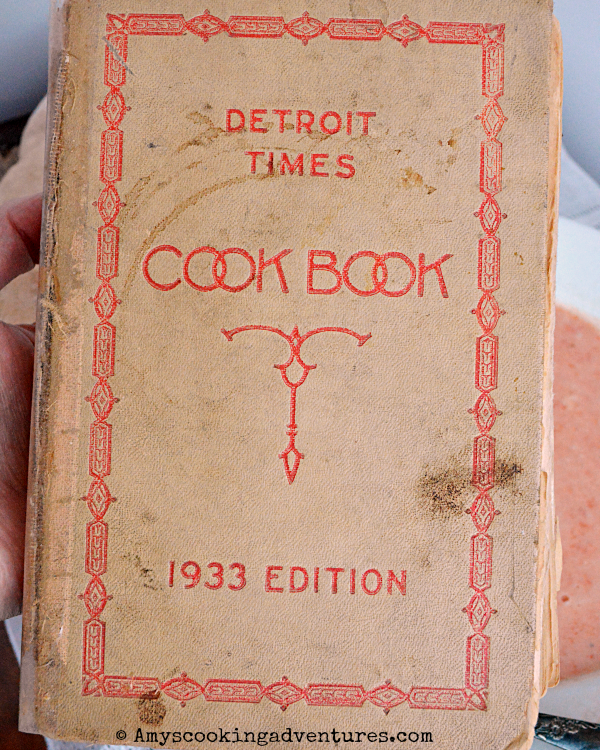 It’s a cookbook put out by the Detroit Times that full of great vintage recipes! 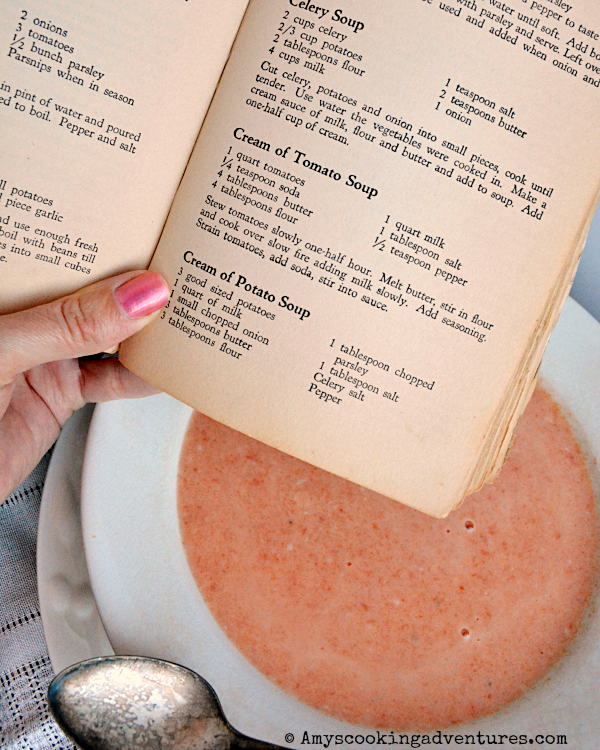 The publishers purposefully left the back few pages of this cookbook blank, so home cooks could add their own recipes, and the previous over did just that! 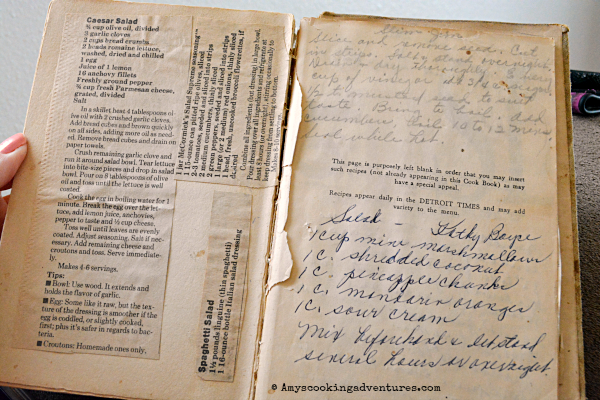 The back (and front) of this book and stuffed full of meticulously clipped recipes from the newspaper, along with a few hand-written recipes to boot! This really is a treasure. I only wish the first owner had written her name in the book somewhere! 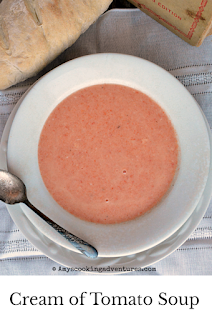 After searching through the book, I came across a recipe for Cream of Tomato Soup and decided right away that I needed to make it! It was the last week of farmer’s market here in town on Saturday, and I came home with a pallet of iffy looking tomatoes for $5 and I needed to start using them! I’ve made quite a few different tomato soups in the past but this one was definitely unique! The creamy sauce played a much larger role than I was expecting, producing a very light red (pink?!?) soup that was still flavorful ad delicious and definitely tomato soup! Add baking soda to the tomatoes was also a surprising step. Since I’d never heard of such a thing, I looked it up. Apparently it’s meant to reduce the acidity of the tomatoes, but modern school of thought is that a pinch of sugar will do a better job. 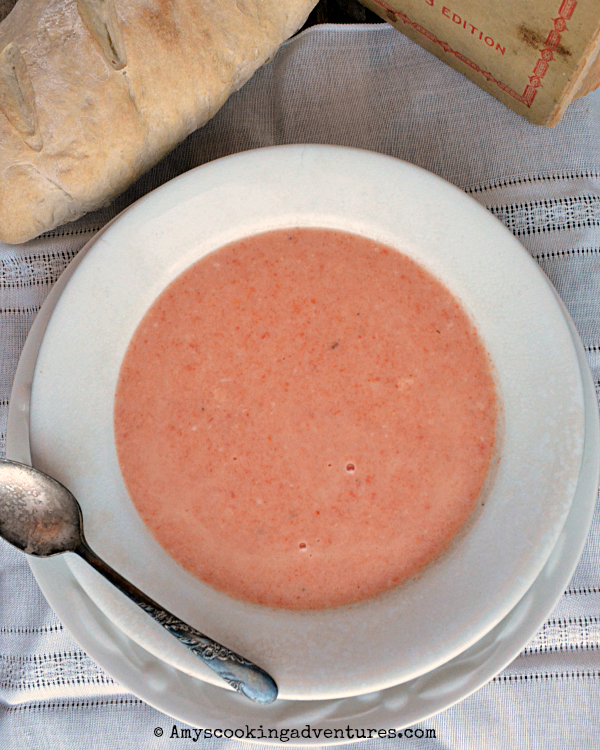 I highly recommend this soup with a side of crusty bread and a meat & cheese tray for a light lunch! Place the tomatoes, basil, and garlic in a saucepan over medium-low heat. Cover and stew for 30 minutes. Once stewed, cool slightly, then strain the tomatoes through a food mill to remove seeds and skins. Stir in the soda. Meanwhile, melt the butter in a soup pot over medium heat. Stir in the flour and cook for 1-2 minutes. Slowly add the milk, allowing the sauce to thicken with each addition. 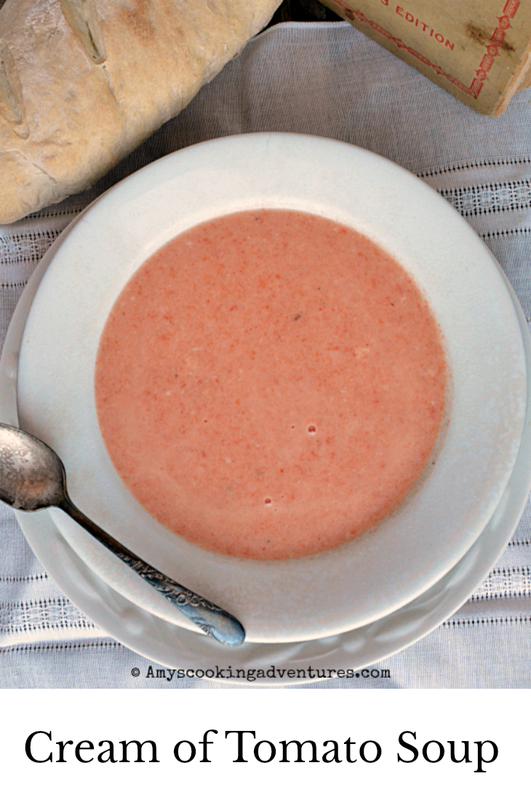 Stir the strained tomatoes into the milk mixture and season with salt and pepper. Heat through and serve with a side of crusty bread. Place the tomatoes, basil, and garlic in a saucepan over medium-low heat. Cover and stew for 30 minutes.Once stewed, cool slightly, then strain the tomatoes through a food mill to remove seeds and skins. Stir in the soda.Meanwhile, melt the butter in a soup pot over medium heat. Stir in the flour and cook for 1-2 minutes. Slowly add the milk, allowing the sauce to thicken with each addition.Stir the strained tomatoes into the milk mixture and season with salt and pepper. Heat through and serve with a side of crusty bread. What a great find Amy. Whenever I go through cookbooks in Antique Stores I get melancholy thinking that these cookbooks were once someone's treasures and their loved ones could have cared less. I wonder if all my cookbooks are going to end up in a yard sale or antique store one day. What a great find! This cookbook is such a treasure. Thanks for the great theme.